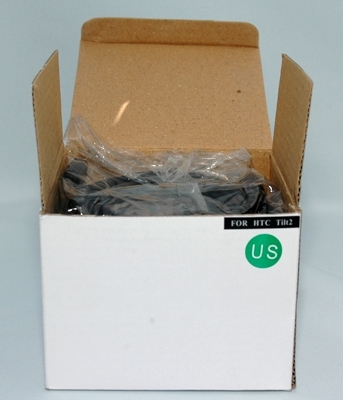 HTC Desk Chargers From Wirelessground.com: Worth It? Built in accessory battery charger. ATT Pure version doesn't take into account the USB port cover flap. If your phone spends a lot of time at the office (home or otherwise), having a desktop charger stand can be a worthwhile investment. Not only does it provide a convenient 'home' for the phone while you're working, but it makes the phone much more useful as a desk tool (clock, next appointment reminder, alarm, etc.) than having it in your pocket. Let's take a look at the integrated desk chargers provided by WirelessGround for two of the HTC phones. I was very pleased to see that WirelessGround has taken to heart the need to simplify packaging and to do their bit to help keep the planet green. It's just so much of a hassle when things are shipped in those plastic 'bubble' packages. 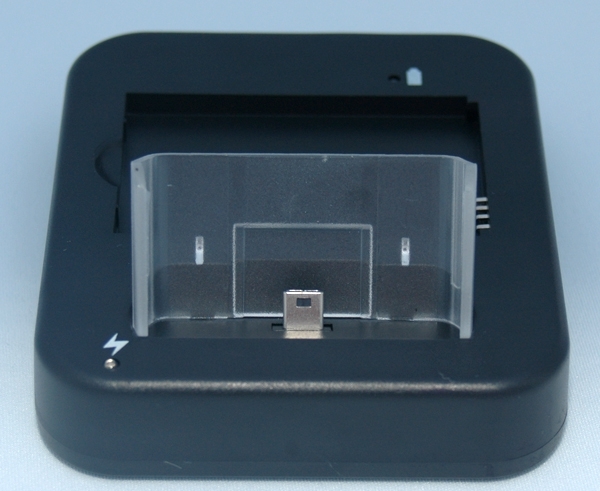 Figure 1: As it comes shipped from WirelessGround. Just a plain white cardboard box, with everything individually wrapped and neatly inserted. 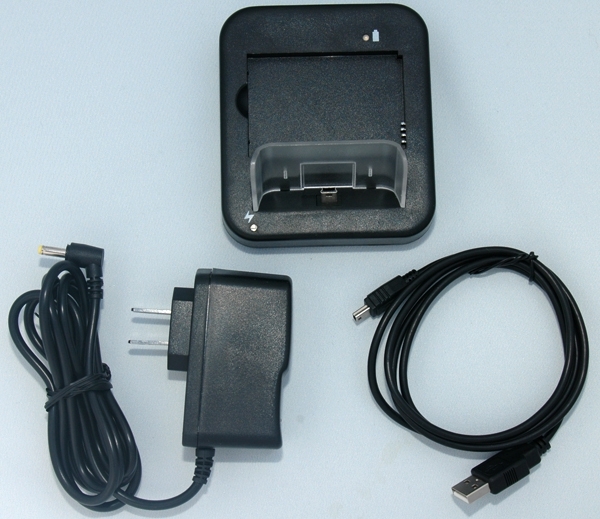 Figure 2: In the box, you get the charger stand, power adapter (100-240VAC input, 5V 1.5A output), and a standard USB to mini-USB cable. 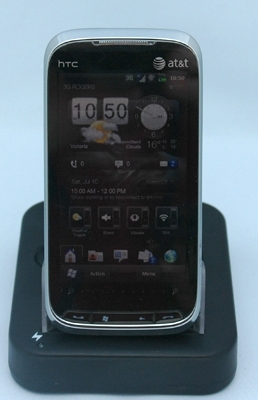 Note, this is one with a truly a 'standard' mini-USB plug -- not the HTC proprietary configuration. The package also includes a small, single sheet of instructions (in English only), which basically explains how the LEDs work on the charger stand. Setting up the unit is pretty straightforward and probably doesn't really need a lot of explanation. It's possible to use the stand with or without the power adapter. With the adapter plugged into a wall outlet, the phone will charge from it. 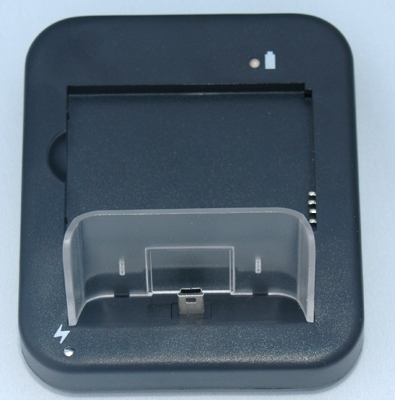 It will also charge a secondary/backup battery pack if you've plugged one into the slot on the back of the stand. Without the power adapter, your phone will charge with power from the USB port (as per normal). Plugging into the USB only will not charge a secondary battery pack. You must have the power adapter installed for that. Figure 3: Here's a top closeup shot of the cradle stand. In the top right, there's a power/battery status indicator, just above the slot where the secondary/backup battery can be placed. In the front left, there's a blue LED which indicates USB powered/connected status. With the power adapter attached without an accessory battery installed, the back LED alternates red/green which can become rather distracting and/or annoying. Fortunately, this is fairly easily solved by either a) installing an accessory battery, in which case the back LED will glow either red for charging or green for fully charged; or b) unplugging the power adapter, since you don't really need it to charge the phone, as long as you are connected to a USB port. As mentioned before, the Blue LED in front comes on when the unit is plugged into an active USB port. It's much more subtle and glows steadily, whether or not a phone is in the cradle. Overall, it has a good, solid construction with a clear plastic barrier/support to guide the unit onto the USB plug and hold it steady. As you can see from the shot below, there's not a lot of clearance between the support and the unit. This is a good thing, since it gives the unit a snug fit, but it does mean accessory cases could be a problem. Figure 4: My Tilt2 all cozy in the cradle. After a week of using the cradle, I haven't had any problems with it at all. The unit feels very secure in it and there's no feeling at the unit is going to fall or tip over. Figure 5: Here's a shot of the back of the cradle, showing the phone support, and the power adapter and USB input jacks. I will say that if you are planning to use this during the day at the office, you might want to invest in a Bluetooth headset. Getting the phone out of the cradle to answer it when it rings isn't quite like a quick draw of your trusty '45 from the side holster, and at least on the Tilt2 I was using, there's no easy way to flip the phone into speakerphone while it's in the cradle. With the Bluetooth headset, you can just leave it in the cradle and continue on working. Since I also have an AT&T PURE -- for those occasions when I don't need a keyboard -- WirelessGround was kind enough to also send along the cradle for it. The PURE version is essentially the same cradle construction, except with a different (thinner width, not thickness) support, which makes sense, since the TILT2 is considerably wider than the PURE. Figure 6: A look at the front of the PURE version of the cradle. From this perspective, it's hard to tell the difference, isn't it? If you use the left front LED for reference, you can see that the clear plastic support is a little narrower to accommodate the physical size of the PURE. Unfortunately, when they designed the PURE cradle, they forgot that the PURE comes with an attached cover flap for the USB port. When this is pulled out to expose the USB port, it interferes and makes it impossible to insert the Pure onto the USB plug on the cradle. Figure 7: You can see at the red arrow, that the cover flap is preventing the phone from sitting down onto the USB plug. Also, because of the close dimensions of the clear plastic support, you couldn't use this cradle if you had installed a rubberized (or otherwise) case on the PURE. All in all, I'm very happy with the cradle for my Tilt 2. It keeps the phone handy on my desk at work, and allows me to make more use of it during my daily routine. It's easy to insert and remove when I need to take it with me, and provides a stable home for my phone. It's too bad I can't use the PURE one as it is currently designed, but I'm not willing to cut off the USB cover flap. Don is a Solution Architect with Fujitsu Consulting, specializing in Security and Project Value Management. He's been working with PDAs and Smartphones since the early days of the Sharp Wizard, iPAQ and Jornadas. As the Enterprise Mobility lead for North America, he works with clients who want to take their applications that one step further into 'mobility' by putting them right on the corporate phones. How fast does this charger charges the battery when using the cradle with the AC adapter? 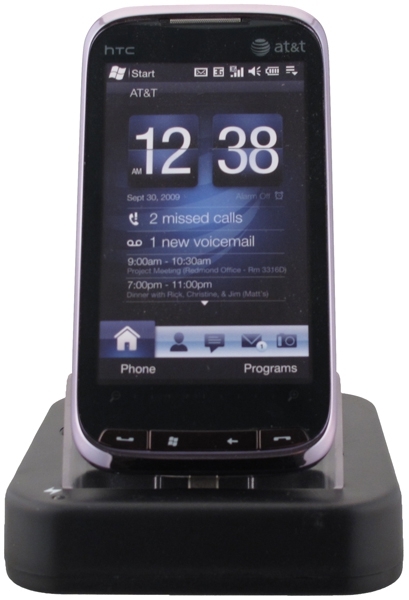 I am asking because I had a very similar charger from Boxwave for my AT&T Tilt2 phone and I could not get a quick charge out of it when having the phone in the cradle. Only when connecting the AC adapter directly to the Tilt2 I was able to have a fast charge, similar to the one I get with the OEM charger. With the Boxwave model the cradle seemed to prevent to fast charge. I also tried another charger that looked different on the outside, which behaved the same way. Needless to say that since both chargers did not perform as the OEM, I returned them. I have the Cellet cradle/charger for my HD2 and wouldn't trade it for anything (other than a landscape cradle for watching movies). Very, very handy. Charge times for mine are the same as plugging into the wall. Thanks for the info. 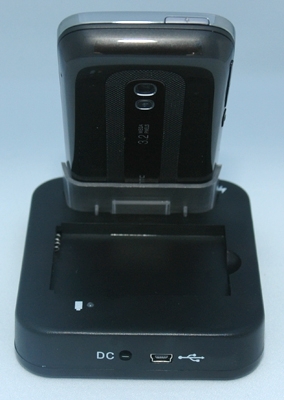 I looked at their website and they have a charger for the Tilt 2 (AT&T). Unlike others, they do specify a charging time which is appealing. I ordered it (from Amazon). Let's see how it lives up to the 3 hour charging time claim. Your quite welcome. I think you'll enjoy having the cradle. I know I do. I hate to disappoint you. Turns out that the Cellet charger for the HTC Tilt 2 phone is no different than the others I already tried. Even though the web site says that it will charge in 3 hours, there no mention of the charging times on the package I received. The charger looks the same as other brnads I already tried which leads me to believe that there is one manufacturer and they sell the charger to different brands. <b>First night:</b> I started with 90% battery capacity left. Five hours later the charge indicator light on the phone was still amber. The phone showed 100% battery capacity. <b>Second night:</b> I started with 70% battery capacity left. Almost 7 hours later the charge indicator light on the phone was still amber. The phone showed 90% battery capacity. So it went from 70% to 90% in almost 7 hours. Using the OEM charger would take no more than one hour to charge the phone on the first night and no more than one hour and a half second night. In the past I had the OEM charger bring the phone to a full charge (with a green charging light indicator) from about 40%. So I guess I will stick with the OEM charger. I've had no issue's with my cradle at all thankfully. Sorry, I missed this when it was originally posted, and was away. From my experience, charging through the cradle is about the same speed as charging from the wall. Noticeably faster than charging via USB alone. First night: I started with 90% battery capacity left. Five hours later the charge indicator light on the phone was still amber. The phone showed 100% battery capacity. Second night: I started with 70% battery capacity left. Almost 7 hours later the charge indicator light on the phone was still amber. The phone showed 90% battery capacity. So it went from 70% to 90% in almost 7 hours. Hmmm, this seems to be a case where the chargers you are trying are not producing enough 'juice' (read current) through the USB to properly charge the battery. Especially on models with larger capacity batteries (like the Tilt2), not just 'any' charger from the market will work effectively - just like some USB ports on laptops can't handle the power requirements for some units if charging, etc. The one from WirelessGround is rated @ 1A output and seems to do the job very effectively.